Pumps: Christian Siriano | Sunglasses: Sold out, love these! Hope you had a great weekend! I had the best time yesterday celebrating one of my bestie's birthdays at Lupo Verde for a girls' brunch! It's an Italian style brunch that is so filling and delicious... some major foodcoma! This top from Aqua combines a few of my favorite trends into one piece with the ruffle detailing, intricate lace, and the cold shoulders. 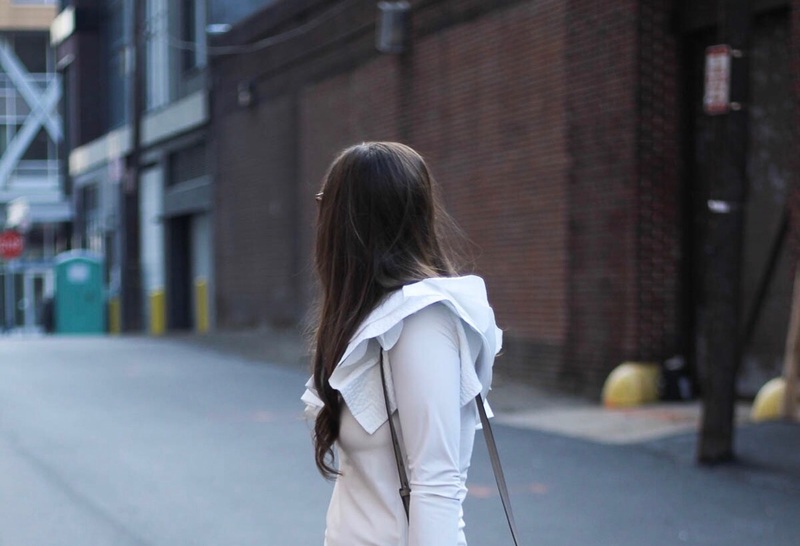 So feminine and flirty, and most of all, super affordable! 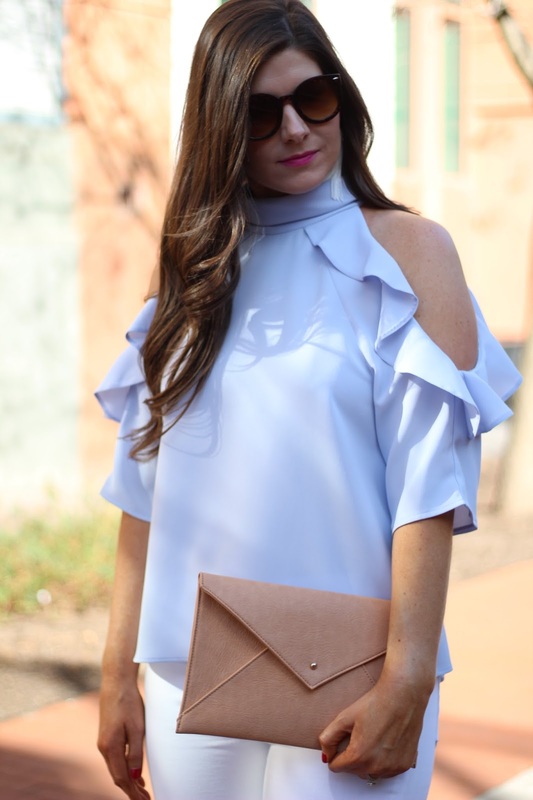 As you all know, I am loving the cold shoulder trend, and this top is no exception. I have mentioned several times how much I am loving the different types of hems we are seeing on denim. From fringed to frayed to flared... I am loving them all! These step hem jeans are the perfect pair to show off some booties or lace-up heels, which is exactly what I needed to show off these pumps! I mentioned I was going back for the black in these fun, lace-up mules and I did! I just can't get over them! Hope you have a great start to your week! Before I begin this post, forgive me that I can't find this top online! I literally bought it on Saturday, and I'm not sure why it's not online yet! If you live near a Nordstrom though, check in your local store for it. For those of you that don't live near a Nordstrom, I will be sure to update you when I see it become available online! It also comes in black, too! I almost got the black but there's just something about light blue and white paired together that scream Spring to me. I also picked up this pair of white distressed denim for under $60, and I am so pleased with the quality! I have been searching for the perfect pair, and I was thrilled to find these. I highly recommend them, but I would suggest sizing down, as they are supposed to stretch with wear. 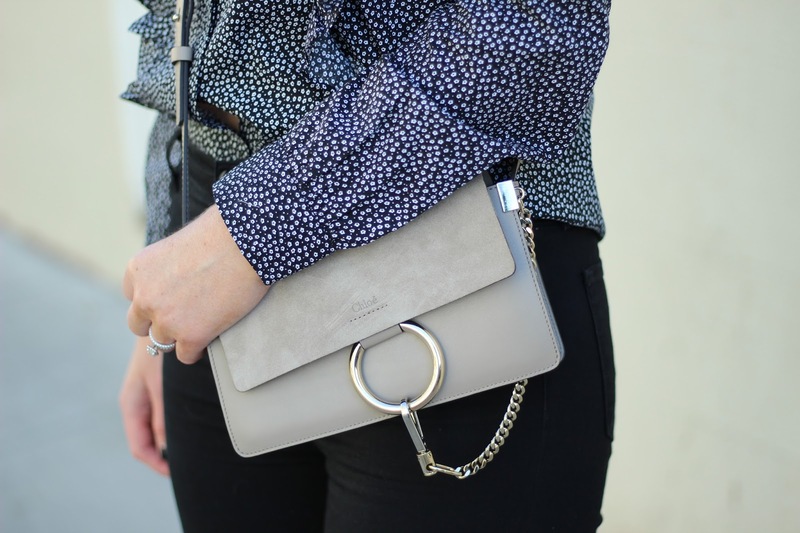 I picked up this cute little tan clutch that looks so similar to the Rebecca Minkoff Leo Envelope Clutch that I love so much! 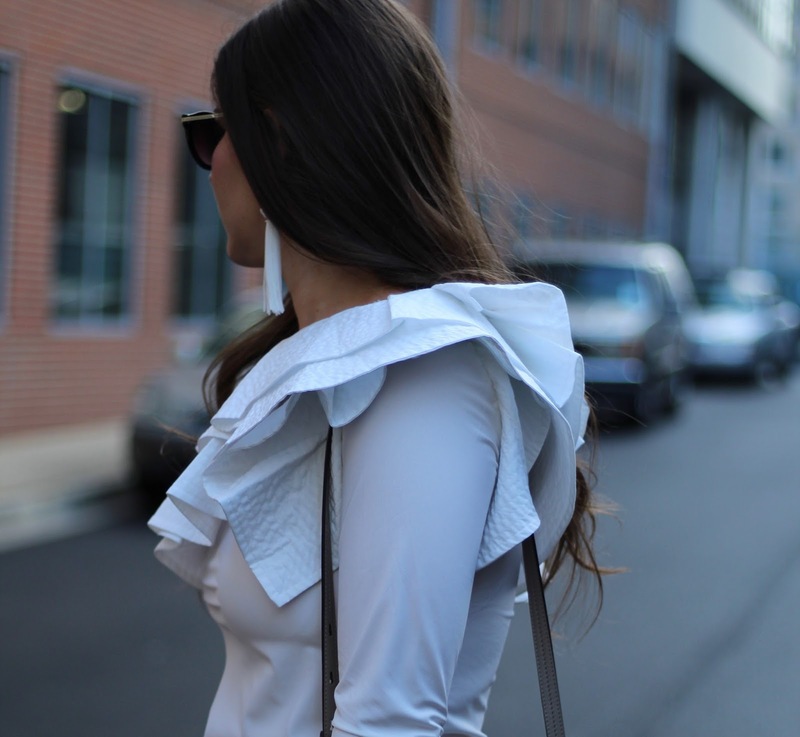 Lastly, I paired this outfit with my favorite tassel earrings that I seem to be wearing with everything! If you haven't picked up a pair yet, I recommend getting the white ones! They literally go with everything!! 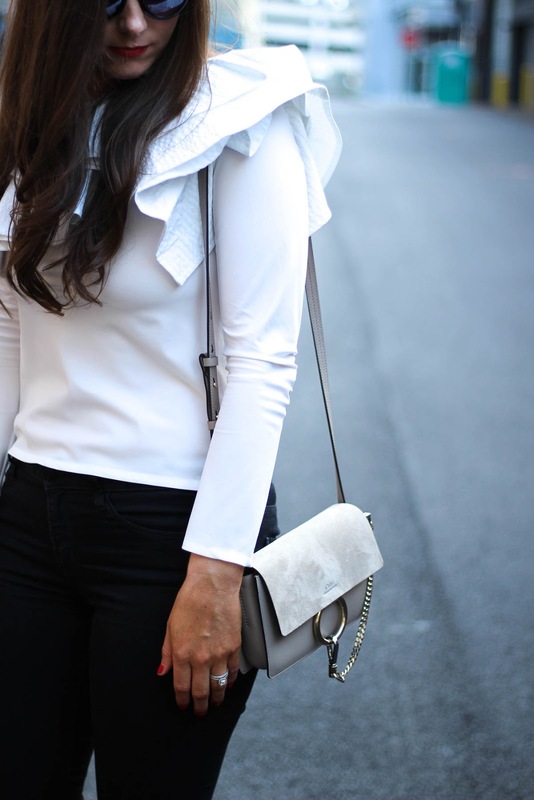 Bag: Chloé | Shoes: Old, LOVE these! Happy Monday!! 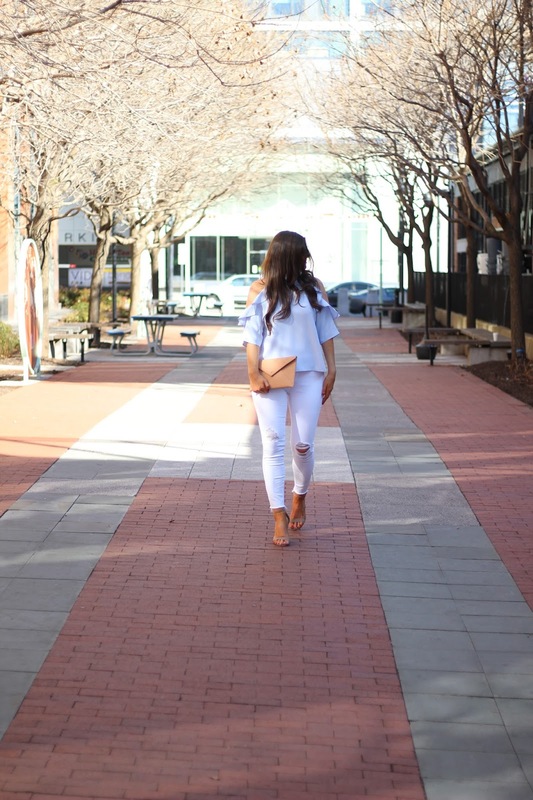 I have been loving all of the fun, frill hems on jeans and pants that I've been seeing lately. When I walked into Zara the other day, these pants were on the mannequin and I knew they would be perfect for transitioning into Spring. I'm not sure if I was just talking myself into them, because to be completely honest, I normally wouldn't reach for something as sassy as these! However, there is just something about them that I'm loving, and I couldn't resist! I'm thinking they would be so cute with an off the shoulder top like this one (need in every color and only $25! 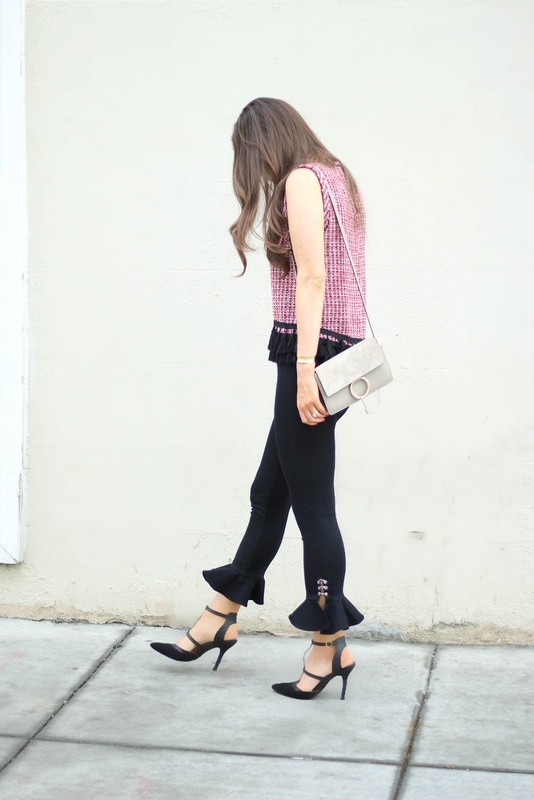 ), and I'm dying for these frill hem jeans that I shared in Friday's post. Really, I just can't get enough! I hope those of you that have the day off are enjoying the long weekend! The weather has been absolutely amazing here in DC this weekend, and I have been on cloud nine! Yesterday, it truly felt like Spring - 71 degrees and sunny! So, so good for the soul! 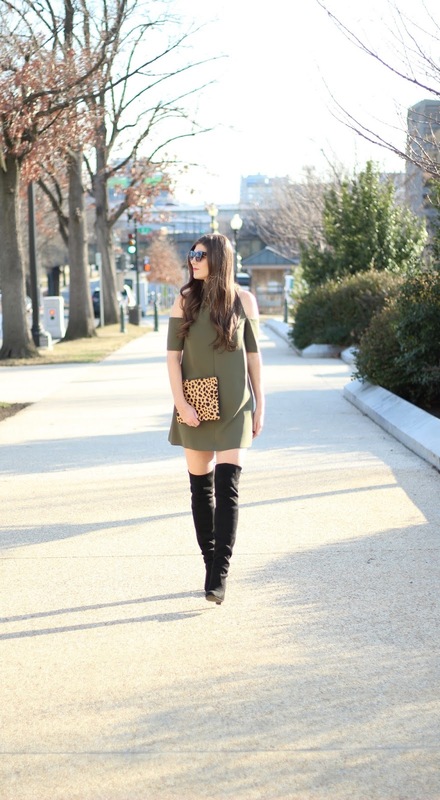 A high collar combined with cold shoulders and a deep V kick this simple dress up a notch! When I saw this dress in the Topshop section in Nordstrom a few weeks ago for under $90, I knew it would be a great addition to my closet. Because, let's be honest - I am constantly reaching for one piece that I can throw on and amp up with a few accessories. I think you could ditch the OTK boots for these sandals once the weather warms up officially, and it would be even cuter! I hope you had a great Valentine's Day! We had dinner at one of my favorite Mexican spots downtown, Oyamel, and it was so much fun and so good! It was my choice for dinner, so of course I chose my favorite... will never get enough chips and queso! This top... these shoes! 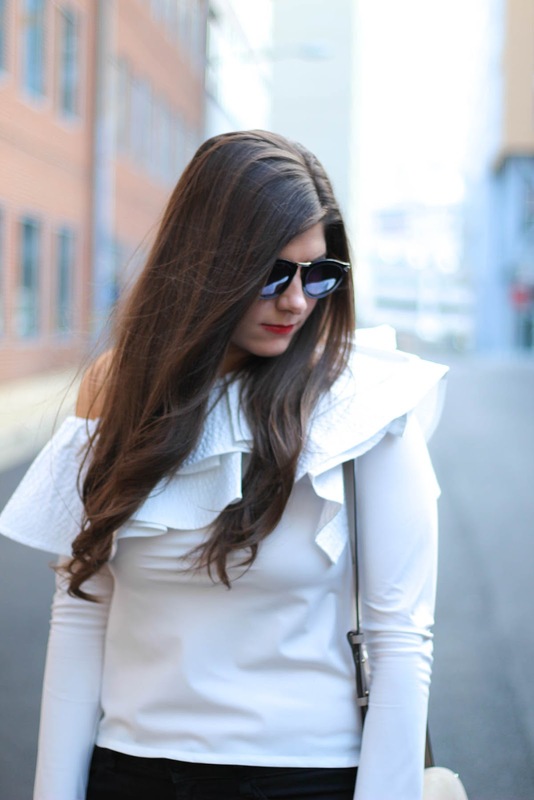 Dramatic ruffles and statement snakeskin make for a combo that can't be beat. There is no denying that I love all things animal print, and these shoes are definitely no exception. Really though, I about died when I saw them. They are on sale for $20 and so freaking cute! I'm going back for the black too. 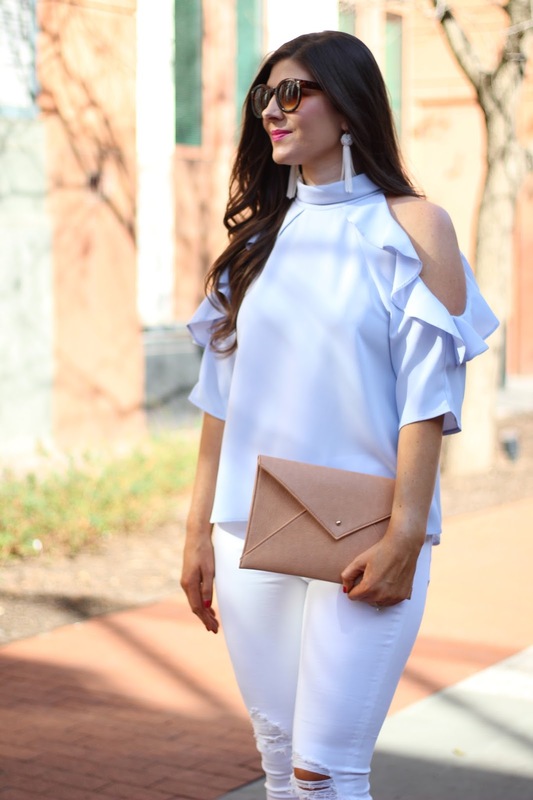 This top has to be one of my favorites I've ever purchased, and I think it would be so cute in the Spring and Summer paired with a denim mini. Lastly, I paired this look with my favorite tassel earrings from Vanessa Mooney. I seriously want all of the colors! They are so fun, and I think they top off this outfit perfectly. Round Sunglasses | Floral Dress | Lipgloss in "Turkish Delight"
Happy Friday!! Today's collage is all about some Spring inspiration for us all! I have been eyeing this Alexis dress for a few weeks now. I adore the top version as well in both the black and white. My favorite earrings pictured in my very first blog post are still a favorite of mine, and I am wanting to add more colors to my collection for Spring and Summer. How cute are all of the colors?! By far, my favorite season is ahead!! I can't wait to start sharing some Spring looks with you over the next few weeks! Praying the DC weather cooperates with me. Literally nothing like pretending it's 80 degrees out when it's really only in the 40's. My southern self struggles in this NE cold!! If you are in the DC area, I would love to meet you this Saturday, February 11th, at Current Boutique Alexandria from 6-8pm! I will be helping host a fun Galentine's Day event with some other local fashion bloggers filled with champagne, chocolate, and 20% off the store during the event! Would love for you to stop by if you are in the area! Hope you have a great weekend! Bag: Saint Laurent | Hat: Nordstrom | Lips: Revlon in "Romantic"